Comments: Evergreen broadleaf native to Northern Africa and eastern Mediterranean Sea coast. 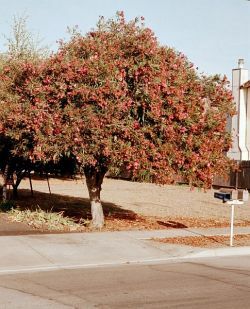 A shrub to small tree with green lanceolate leaves, white, yellow, pink, red or magenta flowers. Flowers are usually single pedaled, but 'Mrs. Roeding' cultivar is a double pink. Oleander, a very drought tolerant and tough plant has been used in freway median planting. Also known as dogbane. This plant's leaves, stems and roots are highly poisonous.